Big Data—Do I Even Need All These Tools? BIG DATE: It’s not all hype. You don’t necessarily need all of the tools and technologies available in the marketplace. Use big data to maximize enterprise value exponentially through better business processes. Many big-data technology companies are putting out good products. Many traditional companies are already making big investments in big data. Research firm IDC predicts that annual spending will reach $48.6 billion in 2019, at a compound annual growth rate of 23 percent. The C-suites of large companies have millions or billions of dollars to invest in IT and, increasingly, they are investing in developing a data strategy. For most executives, this means making investments in new technology tools. They want the “Next Big Thing” they’ve heard so much about. This is where they run into problems, with a high probability of failure. Executives making decisions on technology spending are inundated with options. In all technology markets, including data, there are hundreds of vendors making similar tools to solve similar problems. It can be hard to tell which are better. Company executives often cannot differentiate one from another because vendors create products and services for the marketplace, not for one’s specific enterprise. It’s the job of the executives—not the vendors—to make them work successfully in their organization. The C-suites of traditional companies are not adequately equipped to discern hype from real value. They don’t have the luxury of time and resources to comprehensively assess their options in order to make decisions about where to allocate IT budgets, what outlays to make, and which tools to acquire and adopt. For the most part, this is done as a reaction to market “chatter,” or “qualitative assumptions,” at best. There is no scientific and certain method to doing so. This can make executives very skeptical of not only the tools and technologies, but also of the concept of big data itself, especially if they have been around for a few decades. The market is full of noise and hype. Executives don’t know which companies to trust when there are so many vendors, sometimes ones with as big or even bigger company valuations. They don’t know which tools to buy because they all look the same but promise more. They have nothing to go on but the word of markets and salespeople. Of course, the techies get excited by the very sound of it. It’s both a blessing and a curse, unless you learn how to make it the former. These decisions can cause paralyzing anxiety for decision makers. Millions—sometimes, billions—of dollars in outlays are on the line. Given this situation, executives become worried and even jaded. Every day there is a new start-up purporting to offer the next big thing in technology. This can make even the most enthusiastic and forward-thinking executives skeptical about the whole endeavor. They begin to wonder how they can ever make an appropriate decision, and simply hope someone they trust can make the decision for them. Which tools are the best? Eventually they may wonder, Do I need any of this at all? Isn’t this just hype? The answer is no, it is not all hype. The truth is that many big-data technology companies are putting out good products. In fact, most technology companies that stick around for any period of time are creating good technology offerings. They wouldn’t survive the market otherwise. Many of these companies got started in Silicon Valley and are founded and staffed by the best technologists available. Some are even funded by the National Security Agency in the United States. Your data company might well have had a role to play in helping to find Osama bin Laden. These are reputable companies. If you have checked them out, you don’t need to worry; they will deliver the goods. But that doesn’t mean that you need all of the tools and technologies available in the marketplace. Big data isn’t about tools and technologies alone. It’s about how you utilize the data that is relevant to your business model in order to maximize enterprise value exponentially through improved and better business processes. Ultimately, it’s all about having a better life on the planet, improving the process of life itself. Rather than focusing on what tools and technologies to buy from a “shopping list,” executives need to pause and ask, How can data create value for my business? Only then should they start looking at what tools and technologies to invest in. Most companies will find that they don’t need many of the shiny, new products being hawked by start-ups. Many companies will find that they already have quite a few of the tools they need; they just need to be using them in the right ways to create value. The thing to remember is that big data is still just data; only, it is, as the name implies, data gone bigger. Nothing has fundamentally changed in the way we handle data—only the amount of data handled, the variety of data based on the potential sources, and the velocity of data streams that are relevant to the business. These things matter. They allow us to get more value out of data. They open up new possibilities for valuable insights, but the building blocks are the same. The difference is fundamentally one of scale, not type (scale in relative terms depending on your business model). Imagine you are building a Lego house when suddenly you realize you could piece together more houses and make a Lego city. If you were poorly organized to begin with, more tools will only amplify your inefficiency. On the other hand, if you were well organized and disciplined in the process of sourcing, organizing, and putting the blocks together for building a house, tools will probably make you more efficient and enable you to build a city using similar methods but with better tools. Besides, the multiplication driver is not more tools. For the most part, you just need more blocks—especially if you have been well organized and efficient in the process of building a house to begin with. The process of sourcing the increased number of blocks and organizing them for use, though, now needs to take into account the increased scale, velocity, and probably variety, if appropriate for building a Lego city. Big data is the same. Companies are still just acquiring, processing, and consuming data—only now there is much, much more of it. Remember that it is a realization that we can do more with our data with currently available tools and technologies. Companies don’t need to look for the latest and greatest thing; they need to look for what works for them. Often, this will be a tool or a technology that is relevant and well understood, and which can be managed within their organization without crippling people. Companies spend too much time worrying about tools and technologies for acquiring and processing data. The tools one uses are less important than what one achieves with them. Companies need to put the emphasis back on the basics of a process. The data-strategy setup does not need to provide a host of flashy new tools, but it should support the business processes and the business model. Often—not always, but often—this means sticking with what you know and do. The only difference is doing it well. Justhy Deva Prasad, M.B.A., “D. Justhy,” is the Chief Data Partner at Claritysquare, a global technology firm that helps Fortune 500 clients around the globe transition to the digital age by leveraging data to reduce costs, recapture lost value, and generate new revenue. 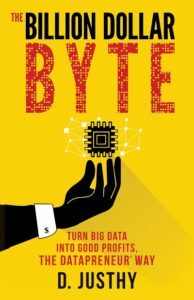 He is the author of “The Billion Dollar Byte” (Morgan James, January 2018).